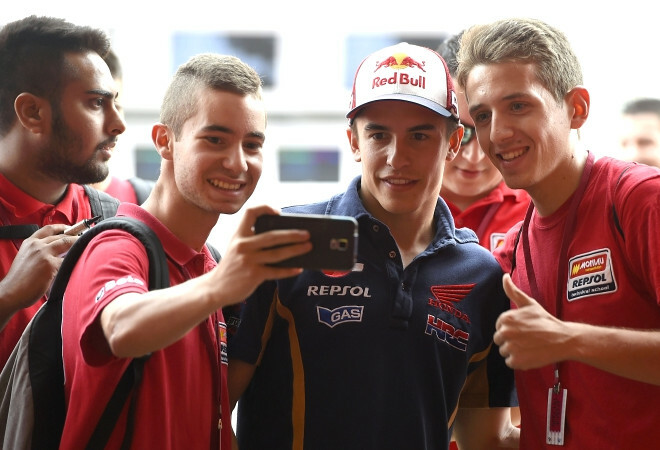 How desperate is Honda to get defending champ Marc Marquez back on track after a disastrous start to the 2015 series? Desperate enough for the proud factory to abandon the 2015 chassis, for the moment, and instead put Marquez aboard a hybrid (2014 frame, with new swingarm) incorporating elements of the bike that dominated last year. If you know anything about Honda, stepping back to last year’s chassis is a very big deal … and an indication of extreme frustration. The Dutch TT this weekend could bring typically wet weather, which adds its own complications. Nevertheless, the effort to figure out what’s wrong with Marquez’ bike continues. Marquez has already crashed out of three races, and made his chances of repeating as champ this year quite unlikely given the form of the Yamaha factory riders Valentino Rossi and Jorge Lorenzo. Before worrying about the championship, of course, Honda wants Marquez back on the podium and winning races. We shall see. Hey VLJ should be really happy. V#46 qualified well. Yep! #46 was fastest in two of the three practice sessions and now he’s starting from pole position. Bizarro world! Call me crazy, but I highly doubt this race will see Valentino three seconds down on Jorge again after only two laps. Speaking of which, it will be interesting to see how Jorge fares, starting from the eighth position. He is the very definition of ‘frontrunner,’ and now it’s his turn to have to fight through the pack. This could be the race that turns the season. I can easily picture Valentino winning this one, with Jorge and possibly #93 also crashing out. Valentino has thus far avoided the usual mishaps that happen when starting mid-pack. I have a feeling Jorge won’t be so fortunate. well another problem Val has is he has never been a good starter. lets hope that changes tomorrow. The was I see it Marquez leads into the first turn followed by Pedrosa, A Espargaro and Val. Val dispatches Espargaro rather qiuickly nad Pedro a lap or two later and then has to hunt down Marquez. I’m going with marquez 1st, Rossi second, pedrosa third and Lorenzo a distant 4th. for the record, try not think of any frame being a 2015 or a 2014, there’s no crying in baseball and there are no VIN stamps in grandprix. for all we know the “2014” frame that won 10 straight could be something they used in 2012…? it’s whatever combination of parts that work. the mantra “if it ain’t broke, don’t fix it” applies. those with an astute memory will recall we’ve already seen this movie. (Bizarro World) Yamaha spending all season deliberately mucking around with a “new and improved” ’06 chassis that obviously didn’t work (or at least that was the story fed to the gullible masses) was what contributed in no small part to Ross not defending his ’05 title. it wasn’t the frame that let Rossi down in 06 if I remember right, it was the .002 loss to Elias? the 3 dnf’s and the lap 5 fall in the last race while leading in points. It doesn’t seem to be bothering Pedrosa much. Not that he’s winning races, but I didn’t expect that. But he’s finishing in 3rd, typical for last year too. They still get the extra two liters of fuel, correct? Q: speaking of R&D, what is the deal with the Ducatis? They appear to have a virtual sling shot attached to their bikes on the straights. Who is the best in MotoGP, after Casey Stoner? A: Ah, well, Valentino is winning the championship, so. Quite honestly, in the last two years, you can’t deny that it’s been Marquez. I think his first season, honestly, being honest, he got lucky, with Jorge and Dani both injuring themselves quite badly during the season. He got some results maybe that he might have struggled with if they were there and fit and healthy. That gave him confidence, and he built on that confidence perfectly. He ran a fantastic championship in 2013, but I think 2014 he came in full of confidence, knowing exactly what he did, with a lot more experience now, and then he did a fantastic job last year. I honestly didn’t expect him to have the season that he’s had so far this year. But knowing a few things inside, it’s just a little bit difficult for him right now with, of course, the bike and setup, things like this. But no doubt they’ll bounce back and he’ll start to push towards the front. But Jorge at the moment is incredibly fast, and Dani without his injuries, we don’t know what he could’ve achieved. It’s always like this. Q Casey, you are a Honda tester. What is the problem of the Honda MotoGP this year? A I can’t say. [Laughter] I know, but I can’t say. So, there you go. And, hey, whaddya know, look who’s leading the time sheets in Assen! The two Hondas! LOL! And check out who led the first practice while leading everyone but the two Repsol Hondas in the second practice…Valentino Rossi! What is this? Did #46 finally wake up and decide that practice and qualifying actually matter?! Then again, Rossi did win in Assen last year. Maybe he just loves this track. Still, it’s nice to see him run faster than Jorge, now that they look to be a dogfight to the very end. Wonder which frame Crutchlow has? He did get a new swing arm. Btw looks like Rossi got a new frame as well. Does Honda still build a certain degree of flex into the frames? If yes, this might relate to the frame performing well in practice and qualifying, then later in race mode the degree of flex changes, making it more difficult for the pilot, similar to a shock absorber changing its damping characteristics. The unknown and unknowable quality regarding such things usually makes speculation boring. But I found this discussion interesting, raising good points to ponder. Don’t all the manufacturers? That flex virtually becomes the only “suspension” available at full lean. Correct me if I’m wrong, but wasn’t there some sort of MSMA gentleman’s agreement (made last year) to freeze/stop development of factory ECU software at Assen 2015, since (according to them) it wouldn’t make financial sense considering the switch to spec ECUs next year…. or something like that. If true, it would really seem like Honda’s tied itself in a bit of a knot, considering they practically run the MSMA and that “gentlemanly” agreement was their suggestion. NATCORK rearing it’s ugly head at HRC? well that or Dorna’s overpaid script writers. He was fast in race 1 (1st lap screw up), won race 2, on a wore out tire in race 3 (stupid crash), then they changed the swingarm. Just saying. Hmmmm… So maybe I’ll save my $184,000 and not buy the Moto GP street version until Honda figures out what’s going on. Good idea, buy three H2R’s instead, one for riding, one for the track and one to preserve for a museum and still have a few bucks in your pocket for tickets to the next GP. Then again, having a “flawed” design could make for a cult collector bike in the future, see Ducati Indiana or HD XLCR for reference. If I remember correctly Marquez led most of the time sheets in pre season testing with the 2015 frame and Stoner did a bunch of preseason testing on the 2015 and never mentioned any issues. I assume Marquez was running a 2015 frame when he was qualifying for the front row in all these races and when was running second last week and that Pedrosa is also running a 15 frame on which he finished 3rd. This may be a confidence thing more than an issue with the frame thing. That could indeed be the case. You’d think they would have spotted a problem with testing before the season ever started, though sometimes problems don’t always manifest until under the full competitive fury of a top rider over the race distance. I do have to say that from a spectator’s perspective (for whatever that is worth) that the bike does seem to be harder to tame this year. Marquez and Pedrosa both seem to be fighting with it more than last season. Well if Pedrosa asks for a 14 frame that would be telling. We will have to wait and see…and what if Marquez crashes on the 14 frame. Then what? Very sharp points (no pun intended). I watched FP1 & FP2 and MM is still going down bucking bronco path of being right on the edge. Aaaaaaand…Marquez has already crashed the ’14 chassis in qualifying at Assen. He’s going bloody fast, though. In his most recent interview Stoner indicated that there is definitely something wrong with the ’15, but that he wasn’t at liberty to reveal the problem to the public. Fwiw, most of the criticism of the ’15 has centered around the motor, not the chassis. Supposedly this new motor is a bear to handle into and out of corners. Thats interesting VLJ since Stoner was brought in to test the 15 frame first and presumably gave it a thumbs up or I don’t think Honda would have gone forward with it. I don’t remember reading any reports from Stoner back then about any handling problems and the only thing we fas were questioning is why Honda wouldn’t release his lap times, with some surmising he was running faster than Marquez and that Honda didn’t want to embarrass their star. I doubt that was the case but did find it strange they wouldn’t release his lap times. Stoner doesn’t need a perfect chassis to go fast as many other riders seem to. He just adapts to what he has to work with and goes fast. That’s why he could win on a Ducati when most others couldn’t. I think all too often the memory of Stoner dominating on a red bike and the Ducati of two years ago become incorrectly combined. The Ducati he dominated on was not the frameless monster of more recent years. Exactly. The Ducati on which he won enjoyed a huge advantage in regards to the tires, and it didn’t sport the ill-fated aluminum and carbon chassis. This could have major implications to the championship points race. IF MM gets in front of Jorge and disrupts his rhythm I see Vale passing him no matter what his terrible grid position might be. “…Nevertheless, the effort to figure out what’s wrong with Marquez’ bike continues…” It might be said that Honda, in reverting to last year’s frame (albeit with new swing arm), has surrendered and admitted defeat Re. the 2015 chassis. Honda’s 2015 results would appear to disagree with Honda’s chassis software and designers, who I’m sure firmly stated the 2015 chassis was an upgrade vs. the 2014 chassis. One presumes principals on the Repsol team required prediction of improved performance to swap chassis, and that a prediction of similar or less performance would always be proclaimed “fail.” A lateral move in this series is simply too close to stepping backward, which appears to be the case here. At least it only took them a few races before they decided to throw some humble pie in the oven. Unlike Ducati who stuck to their “improved” bike for years. It will be interesting to see how Marquez does this weekend. I wonder why it is that they(Honda) would make changes so extensive as to make a chassis so much worse than a prior completely successful design. I understand that they would answer to any technological advances the other factories might make, but how many changes did they think they needed to make to do that? Apparently far too many. Enough to bring them to go back to the previous design. Why mess with something that worked. They are not making that much more horsepower than last year. I know chassis refinements are the key to going faster, but I would think they the chassis would be small adjustments rather than enough to bring this response. They must always work to stay ahead. They used to have one competitor (JL’s Yamaha), now they have several. Standing still is going backwards in racing. Sometimes it doesn’t work out. I’d bet the changes were pretty small. It’s not like the Honda has become a boat anchor, it’s just not as assuredly dominant as it was before. I wonder what Crutchlow is riding? While he’s not winning, he has been pretty competitive. I hope that does the trick. Since MM came onto the Motogp scene, he has made it so so much more enjoyable to watch. His riding style and polite professional personality is a breath of fresh air. Was there a Colin E somewhere a while back? I really like the guy, too. He is a hell of a racer and seems to have a great personality and refreshing enthusiasm about him off the bike as well.